Project Crimson has a strong focus on environmental education in schools throughout New Zealand. Encouraging children to take pride in their environment and to see the value of biodiversity is important to the Trust. 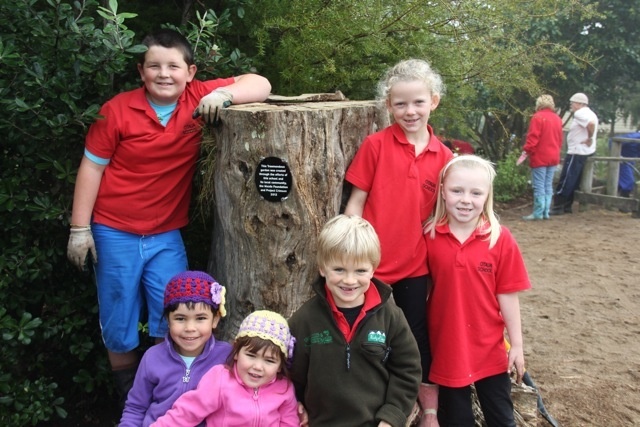 New Zealand primary and intermediate schools can apply to transform their school grounds through a TREEmendous School Makeover as part of an initiative by the Mazda Foundation and Project Crimson. Four New Zealand schools each year are chosen to have their grounds improved and enhanced through the implementation of their ideas, be it a lizard garden, a substantial native planting, creation of our outdoor classroom, creating bird habitats or all of these and more! These TREEmendous School Makeovers are completed by the travelling TREEmendous team, who along with the school community will create a beautiful native tree garden that everyone can enjoy for generations. The TREEmendous programme was a finalist in the 2017 and 2015 Green Ribbon Awards. Run by the Ministry for the Environment and Department of Conservation these awards recognise the outstanding contributions made by individuals, organisations, businesses and communities to protecting and enhancing New Zealand’s environment. You can watch a video of one of our TREEmendous School Makeovers here.